Here's another mutton recipe inspired from the Kashmiri delicacy Mutton Rogan Josh. There are quite a lot of variations from the original recipe. Hope you enjoy the recipe. Heat oil in a pan, add all the dry whole spices (cloves, cinnamon, cardamon, bay leaf). Add sliced onion. Saute till onions are browned (take care not to burn the onion). Now add ginger and garlic paste, saute for a minute or so. Add the mutton, saute for 2 minutes on high flame. Add water just enough to cover the mutton, add salt. Cover the pan with a lid and cook for about 30 to 40 minutes on medium flame or until the mutton is cooked. Top up with water if you feel water has evaporated during the cooking process. Now, in a small bowl, dissolve the chilly in some water and add to the mutton, mix thoroughly. Now add fennel and ginger powder, mix thoroughly. To this add curd, adjust the seasoning. Cook for another 5 minutes or till the sauce thickens. At this point, add the ghee and switch off the heat. 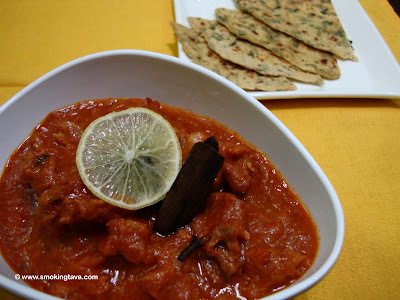 Enjoy mutton rogan josh with rice or naan.